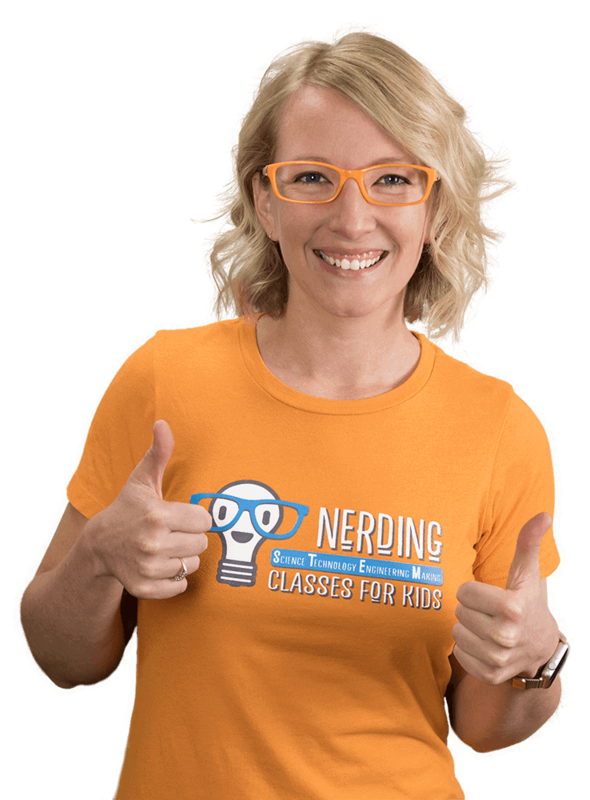 I’ve always loved teaching STEM, and the very first Nerding summer funded the purchase of some great tech tools for my 4th grade classroom. Let’s be real. I like toys. But as a teacher, I was faced with the age-old education problem of “never enough time”. With so much being asked of our students and teachers, so often the first things to get cut from the classroom are science and creative projects. One answer to “never enough time” was to actually create more time. I started designing extracurricular classes that melded important academic content with cutting edge tools and engaging activities. As long as they were hands on and interactive, kids would be able to engage deeply with the content in an after school and summer setting, thus giving us “more time”. I also saw the kinds and quality of the classes being offered after school at my campus and in summer programs. The problems were glaring: same classes being offered over and over for years, too many kids in the class, and instructors that were college age or couldn’t manage a classroom. The answer to this one is so simple, use cutting edge tools with academic curriculum, keep student/teacher ratios low, and employ real teachers with classroom experience. The class content can be learned by our teachers relatively quickly, but classroom management and the ability to question and push kids’ thinking is a skill we hone for our entire careers. Anyway, the rest is history. Hope to see your nerd in a class soon! Real science kids can understand. No flashy demonstrations with no knowledge transfer here. Kids will come home with a story of how instead of just what. Learning how technology can help us solve problems is the goal. Use technology to work for you to create and augment learning and sharing information. The world has so many problems. Let’s work on solving them. Use the Engineering Design Process to Ask, Imagine, Plan, Create, and Improve ideas and designs! Tinker! Create! Build! Get your hands dirty! Kids shift from being a consumer to being a producer. Work on fine motor skills and learn properties of materials. Robotic technologies are advancing quickly and integrating more and more into everything we do! Plus, we must be ready when they try to take over, right? Coding is becoming a fundamental literacy. The basics are important in almost any career, and kids need to be prepared for a digital future we can’t even imagine yet! Robotic technologies are advancing quicky and integrating more and more into everything we do! Plus, we must be ready when they try to take over, right? Coding is becoming a fundemental literacy. The basics are important in almost any career, and kids need to be prepared for a digital future we can’t even imagine yet! Our first (adorably humble) summer. We kept it small and simple holding classes at our house in Chandler. We needed more space, and began using the great community room at Children’s Dental Village. Created more summer classes. The next school year we began Nerding as an after school program in Kyrene. Expanded summer age groups by hiring Mrs. Kiefer, and rented a commercial space with 2 classrooms. The start of a new chapter. We rented the entire Desert Sun Campus in Chandler. We are going to need a longer progress bar! Same Location as last summer. 5 classrooms. Hiring more amazing teachers. So excited for what’s to come. Look for multiple locations in 2020! We will of course be at Desert Sun again because they are the best! Such amazing teachers and staff. We are excited to start expanding throughout the Valley.